This one is loaded with bright color. Bold fuschia is the main color of this scarf with ranges of color from yellow, gold, orange and red running through it as well. There are also touches of green, lilac and white. The jeweled piece hangs almost 3 inches and starts with a yellow jade round surrounded by faceted orange ovals. oval bead surrounded by tiny orange/yellow faceted rounds. 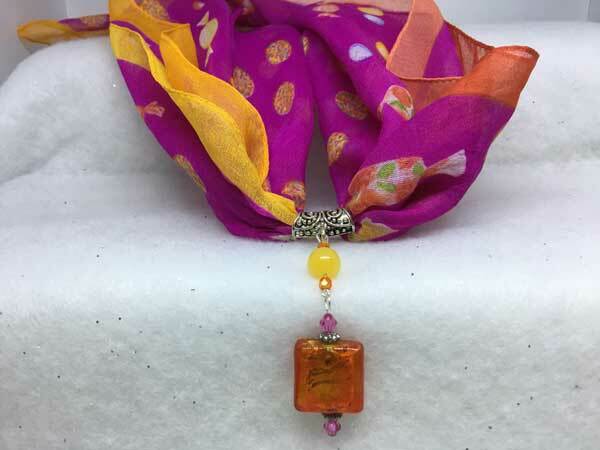 The bottom focal bead is an orange/yellow large square foil bead with silver spacers and small pink bicones above and below. This one will get noticed!